Someday all our devices will be wireless, so our files and media can flow automatically between fixed devices like the storage attached to our home computers and portable devices like PDAs, media players, and digital cameras. Until then, we're stuck with a lot of manual messing around whenever we want to get photos from a digital camera -- Bring the camera back to the computer, dig out the necessary cables and docking connectors, fire up the photo software to upload the files, and then shutdown and disconnect the camera. The Eye-Fi Wi-Fi-enabled SD card just ends all that fuss (www.eye.fi). It's a standard SD memory card with built-in Wi-Fi wireless networking, so it can upload your photos whenever you are in range of your home wireless network. The Eye-Fi SD card works with many models of digital cameras, with a good 2 GB of storage for your photos. It was released in October 2007, and is priced at $99. To use the card, you first set up the wireless interface by connecting the included USB reader on a PC or Mac and running the Eye-Fi Manager software. You then configure your home wireless connection, and specify the location where you want the files transferred -- to your local machine (running the Eye-Fi software), or to a photo sharing website (via the Eye-Fi Web service). I was hoping to take advantage of the card to do some more tricky things like transferring non-photo files or adding Wi-Fi capabilities to a Palm Treo PDA, but the Eye-Fi card is relentlessly focused on working simply and well with digital cameras. Even so, from my experience it's still useful to understand some of the additional details about how it works that are not explained in the documentation. And, since it works silently and without any feedback, there are some useful ways to test it out and monitor its actions before walking off with a camera. 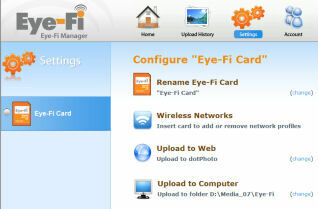 You first set up the Eye-Fi card and Eye-Fi Manager software by creating an account on the Eye-Fi server. You must have an Internet connection to use the software, even if you just want to transfer files to your local machine. You then configure the card to connect to your wireless network, and specify the online photo service and/or folder on your local computer for uploading files. 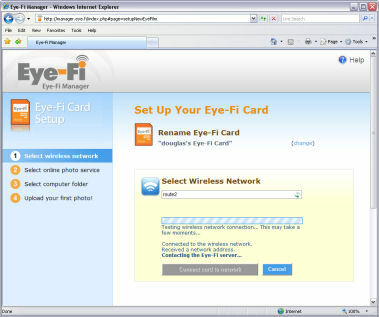 If you are uploading to your local computer, you then must leave the Eye-Fi Manager software running to receive the files from the card. The Eye-Fi card supports 802.11b/g, Wi-Fi, with a typical range of 90+ feet outdoors and 45+ feet indoors. It supports the typical Wi-Fi security mechanisms, including Static WEP 40/104/128, WPA-PSK, and WPA2-PSK. While the documentation stresses that you do not have to change your wireless network settings, it's much easier to set up if you temporarily turn back on SSID broadcast if you have it disabled for privacy. By default, the Eye-Fi Manager software than can find the available networks, and even figure out the security type used so you can configure it as needed. Otherwise, you'll need to choose "Other Network" and enter all the information correctly yourself. 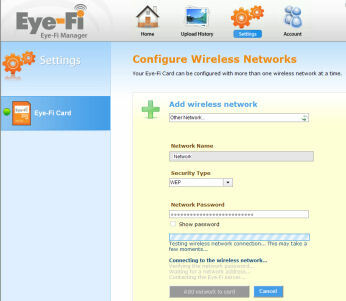 Eye-Fi Manager than tests the network connection through the card and confirms if it is configured properly. So, where do you want your photos stored? On your computer, or uploaded directly to a Web photo sharing site? You can configure the Eye-Fi card to upload photos to a folder on your computer. You then just need to leave the Eye-Fi Manager software running to communicate with the card and store the transferred files. The way this works is that you enter the login information for accessing the desired photo site. 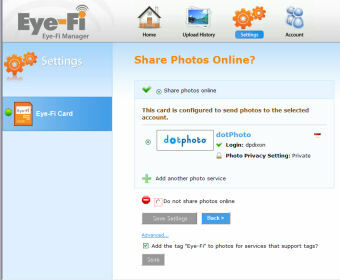 The Eye-Fi card can then upload your photo files to the Eye-Fi website, which then transfers your uploaded files to the specified sharing site. In my case, the files were uploaded successfully to dotPhoto, and then saved in folders named for the date the photos were shot. However, in my testing, I could not get photos to upload to both my computer and a website -- It could do one or the other, but not both. The company reports that this sound work, by uploading locally, and then from there to the Web. The purpose of the Eye-Fi card is to upload new files, and so it will attempt to do so whenever it's powered on, in range of a Wi-Fi network, and notices new photo files stored on the card. This means that it will upload when installed in a camera (while powered on), and also when it's inserted in the Eye-Fi USB reader. This means you can test the card by inserting it in your computer, view it like any other removable storage device (i.e., in Windows Explorer), and then drag and drop photo files to the card (to the DCIM folder). The card will then start uploading the new files, and, even better, the Eye-Fi Manager software will show the uploading progress as each file is transferred. In this way, you can confirm that the card is connecting and uploading successfully before you move it to a camera. Note also that you can dig into the details of the Eye-Fi card's operation by using the software to upload and save the log file, showing attempts to connect over Wi-Fi and upload files. - It only transfers .JPG photo files -- not higher-quality RAW, for example. And you can't sneak around this by renaming a file on a PDA to JPG, because the company reports that the card actually checks for JPEG picture content. - It only transfers new files found in the standard DCIM photo folder on the card (and any folders nested below it). All other files and folders on the card are ignored. I also saw some problems when testing the card by dragging and dropping multiple copies of the same file -- some files with alphabetic characters in their names (instead of just numeric photo sequence numbers) were not uploaded successfully to the online website. And the card was very confused by dragging a file named "zztop.JPG" (zztop111.JPG was OK) -- though obviously this is rude test well outside the bounds of its designed and purpose. I also saw a problem with the Eye-Fi Manager software starting automatically at boot time, and then refusing to display the application interface. Apparently this is a known problem. You can work around this by killing the task and then setting the software to be run manually. 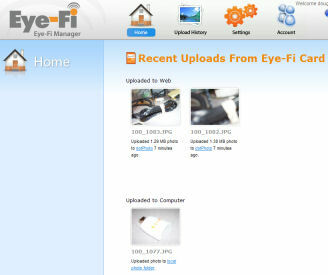 Also see the Eye-Fi website to download the latest firmware and software updates.